I’ve been dying to get out of the city for months now, but with all of the holiday plans, it was definitely out of the question. That’s why I was so excited to get a weekend away to spend in Tahoe with my favorite boyfriend. We drove up late on Friday night so Saturday was our one and only day to be out and about. Since we were still both recovering from some harsh colds, we opted to relax and just enjoy the snow. This meant I could opt out of ski pants and jackets in favor of something a little bit more fun. Since the plan was to relax in the beer garden and do a bit of reading and maybe play a few rounds of cards, I threw on one of my coziest winter dresses. 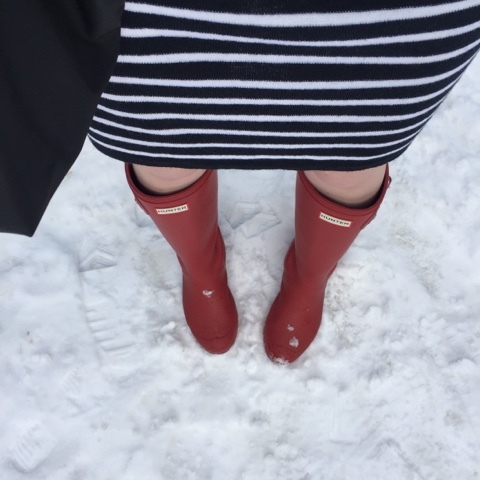 This navy blue and white striped dress is made of 100% wool so it was perfect for keeping me warm in the snowy weather. I actually couldn’t believe that it was able to keep so warm while it was SO cold out (say hello to 25 degrees fahrenheit). Dress, I applaud you! Since we were only in Tahoe for a day or two, I tried really hard not to overpack my suitcase with non-essential shoes. I opted to bring a pair of Sperry saltwater duck boots and my super packable red Hunter boots. I loved that I could roll these boots up quickly and that they only took up a small amount of space in my bag. As if the dress wasn’t cozy enough, I wanted to protect my ears and neck from the super chilly weather. 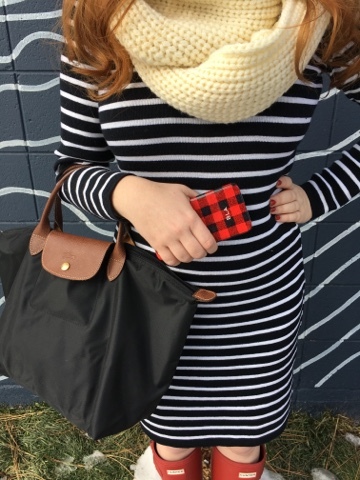 I threw on a chunky knit infinity scarf from J.Crew factory (on sale now for $19)! I really want to pick up every color of this scarf, it’s that comfy. It’s the perfect winter accessory. This relaxing weekend away was just the ticket I needed to begin my week with renewed energy! Monday, I got you. Such a cute winter look…love the boots! I'm dying to get out of our city and up to Flagstaff where there is snow. Hopefully this coming weekend! What an adorable outfit! Love the boots you paired with it! Your striped dress with the hunter boots is so cute!!! You look adorable! This outfit is on point! I love the red boots 🙂 I actually put those boots in my 2015-2016 winter boots must haves post haha they are so adorable! Such a perfect pop of color! You're making me miss Tahoe! We sold our house up there a few years ago and now I'm wishing we still owned it. Love the red boots! So fun!! I love the striped dress + Hunters combo, too. I need to get myself a pair ASAP! 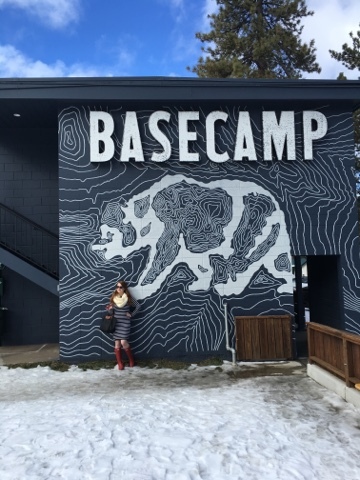 I love Tahoe <3 I keep telling my husband we need to make a trip out there! I loved this outfit so cute especially paired with the red hunter boots! 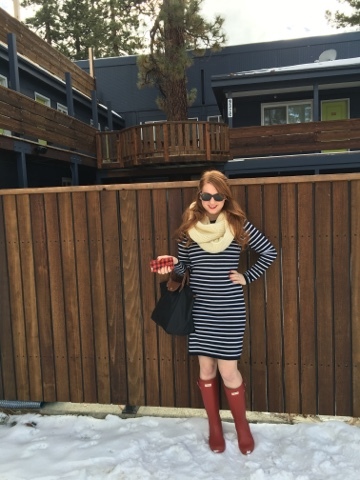 Such a cute classic look- I love stripes and Hunter boots are great for the snow! I love your outfit and I hope you are enjoying your holidays!